ok ... not really but I did have an awful fight with Blogger this week trying to get my photos on my Blog. I'm sure it's not too hard for you to guess who won? Well, not really because here I am with my card but it sure caused lots of frustration in uploading. I really like to have my upload done early. ANYWAY .... welcome back to this week's Color Dare #27. We're monochromatic this week with green --- Topiary, Sweet Leaf and New England Ivy. 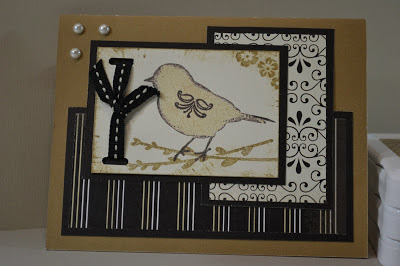 I really struggle with monochromatic but I found a cute card to CASE from the Featured Stamper Challenge this week on SCS. Well TGIF! If you're in the North or Midwest, stay warm and drive slow! I hear more snow flurries are coming. Brr.... I hear cold temperatures are headed our way for next week but today it was sunny and 48 which made a wonderful day to head to the park for a walk. Now yes, it was still "winter" but when you live in the Midwest, you have to take nice days when they come. Of course, with chilly temps, comes time for of warm winter "stuff" ... Like hot chocolate, coffee, tea and all sorts of other yummy sipping drinks. Tonight I pulled out some scraps I had of Sasparilla, used the MOJO Monday #276 Sketch and of course added "hot cocoa" for the H2H Challenge. I think I use this stamp set "A Sip" every January, LOL! Whew, January is just buzzing along and already we're at another week for our Color My Heart challenge! Hopefully now that life has settled down after the holidays you're finding time for some creativity? It's all good here! 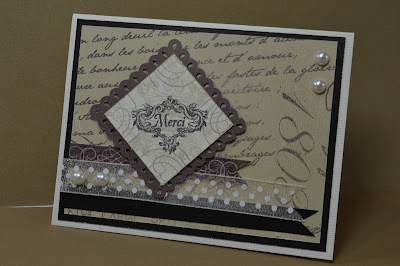 I love January for Stamping and Scrapping! This week's challenge is to use BLACK and WHITE ﻿ with just a POP of color. It seemed more difficult to me than when I first saw it as it's hard to use just a "pop" of color. I'm a color kind of gal, LOL! If only I could do "elegant" ... 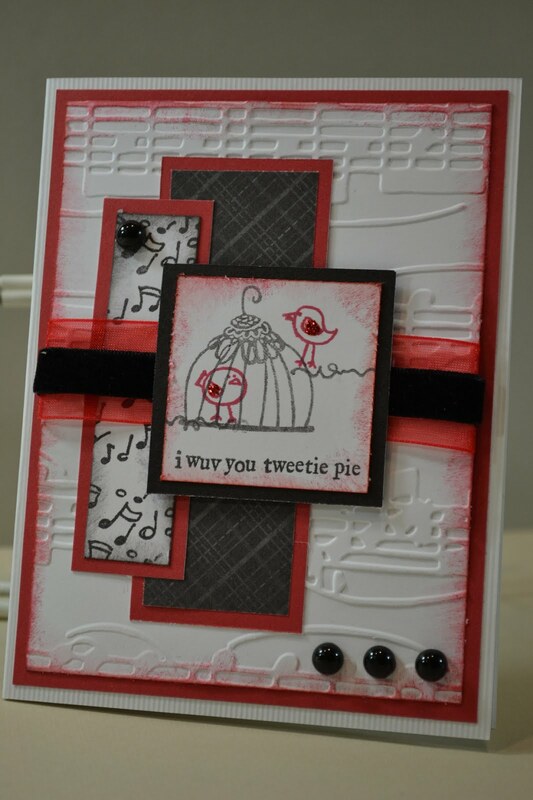 I'm sure if you check out the other cards by the Design Team you'll see more FAB black and white w/ a pop of color creations! My card is based on the sketch from Sketch Frenzy Friday. I hope you'll challenge yourself to come and play along! Today was such a nice day. My DH took me out to breakfast at Waffle House to celebrate my first 2 weeks of sticking to my eating/workout plan. He knows I've been working hard and I wanted to fit in a "treat" at my fave breakfast spot. I *almost* talked him into letting me take picts, LOL! It was then time for some of those "errands" you just put off ... like returns. We ended up at Kohls for house stuff. I know that none of this was his favorite things to do but he was so willing to be a good sport. I went last night scrapbooking with GF and I leave tomorrow for business so he was just hanging out with me today and that was really nice. I guess after 25 years of marriage, sometimes just hanging out is really nice...wuv U! This Sketch is this weeks Mojo Monday #275 . 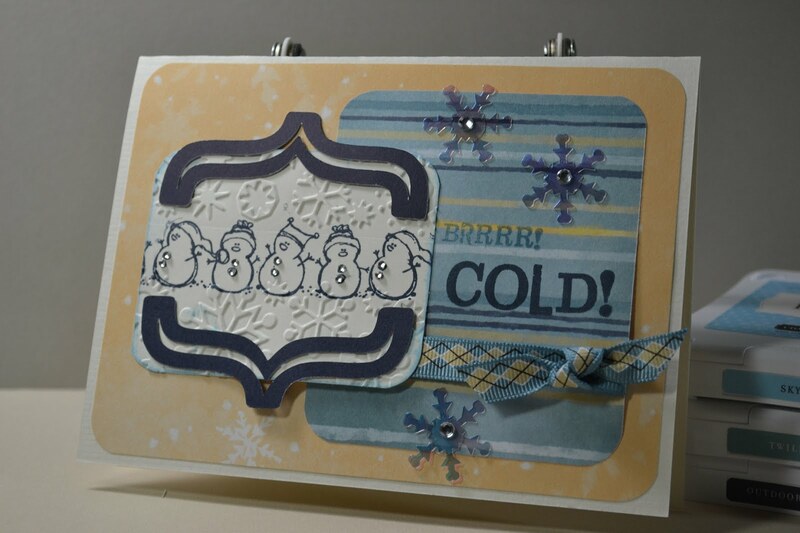 When I first saw the sketch I just wasn't sure what I was doing but you're getting a "sneak peek" of our ABC Challenge Card for this week which was my Inspiration for this card. I used birds for our Fly Away Challenge at FTS. I'm SO excited! 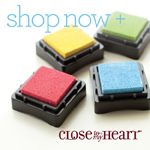 Today is my first time posting as a Design Team Member for "Color My Heart". ﻿ Thanks to Sarah for giving me a chance to share with you on all the FUN Colors that are chosen each week to work with. This weeks Color Choice -- Indian Corn Blue and Ruby. Great color choices to get started. Now, these colors are listed in CTMH (Close to My Heart) Ink colors but we definitely invite you to use any and all close colors from other companies for this challenge. Just use this color combination. 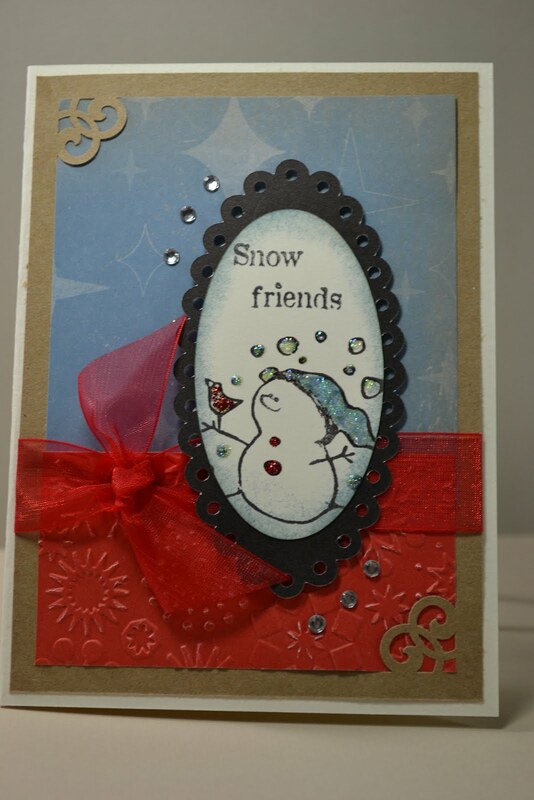 If you've been following my Blog this week, you'll note I've been playing with CTMH Snow Friends Stamps as they're my absolute FAVORITE CTMH stamp so far ... Here it is again for our color challenge today. 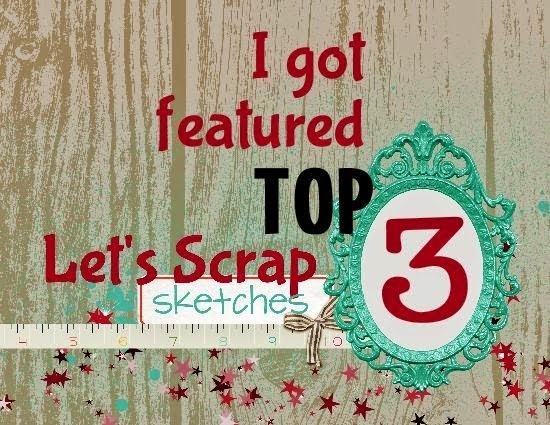 The sketch is this week's Sketch Saturday #240. This is also for the Heart 2 Heart Challenge Snow Fun. 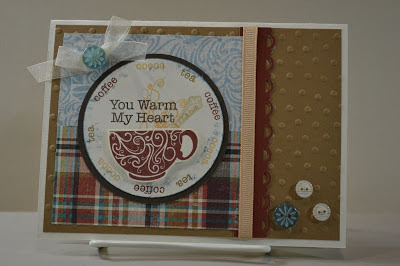 Be sure to stop by at Color My Heart and see all the Inspiration from this week's colors! brrr.... COLD .... well, not today! Happy Wednesday! I'm back with another of card using my fave stamps - Snow Friends! These little guys are so C-U-T-E! 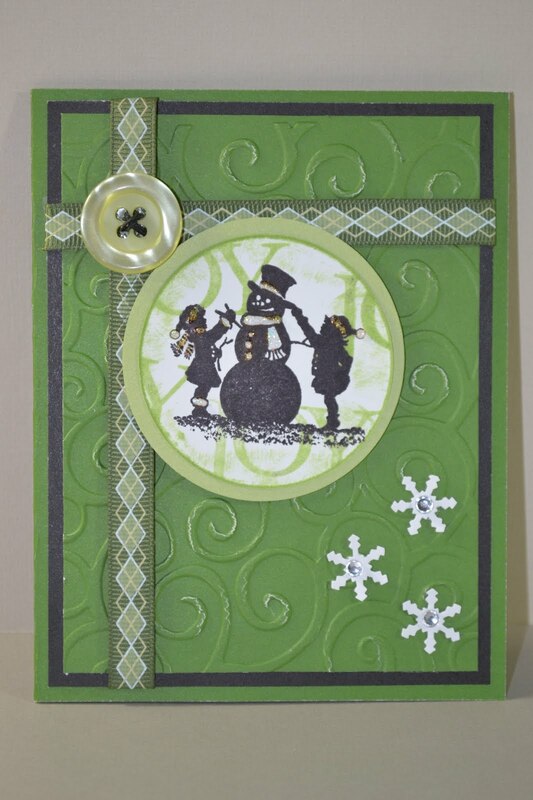 I even found an old pack of CTMH Aspen paper and I thought it went perfectly. It's really warming up here so I did have to chuckle that I was using the sentiment "cold". If you're from the South or West, then maybe 40's are cold? LOL! I started with the sketch from this week's challenge at CLP however, it just wasn't coming together so I actually moved it around and ... well, now it really doesn't look like the sketch any longer. 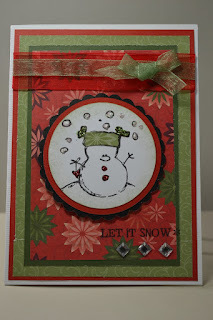 It does though look like Snow Fun which is the challenge over at H2H this week. 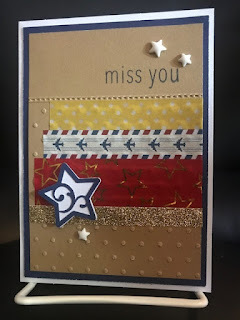 I was digging for this paper pack as these colors are in this week's challenge at colour Q challenge. 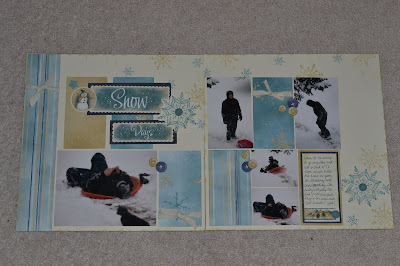 I started this layout with the plan to use neutrals, but like many scrapbook layouts, it changes as it goes. This one did too. 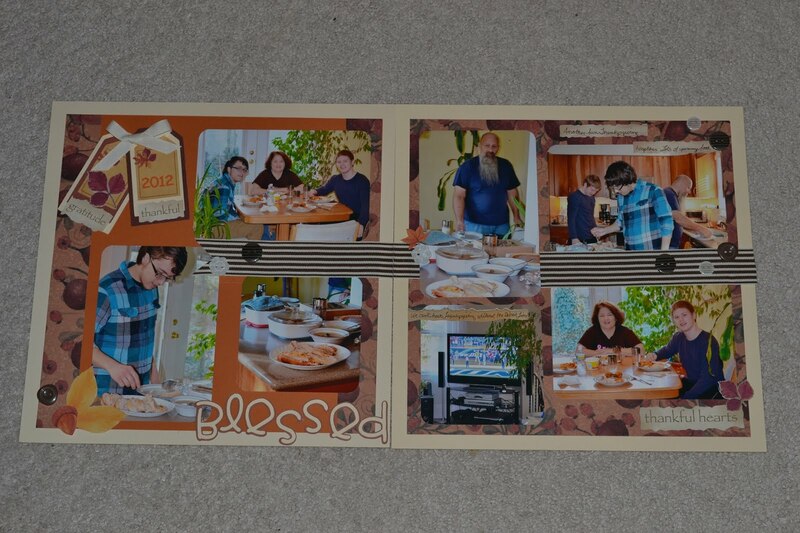 I've used this CTMH Abundance paper the last 3 years for Thanksgiving layouts. I guess some things never change. It will next year though because I have now used up the pack I had. We had such a good time on Thanksgiving. It's good when the family comes back home to spend time together. Always good for new memories. It seems though looking back that many of my picts look similiar too so we like our traditions, LOL! The sketch is from Nuts About Sketches #246. 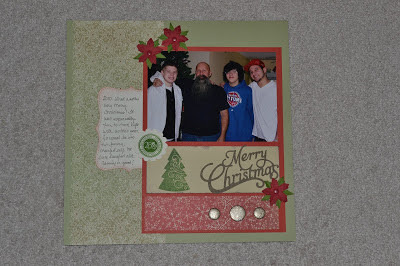 This month's challenge at Scrap Our Stash is to use Tags and I loved that idea for my first page. 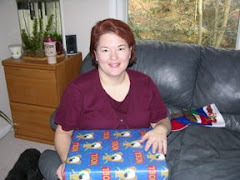 I discovered a new challenge blog this week called Shopping Our Stash. That's definitely my motto for 2013. I've sorted, organized, purged and shared and now it's time to keep using all the goodies that I still have. I actually do feel much more motivated with my new Stamp/Scrap/Office Organization! 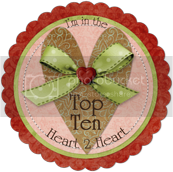 Hopefully you're seeing it here on my blog as I've posted daily! 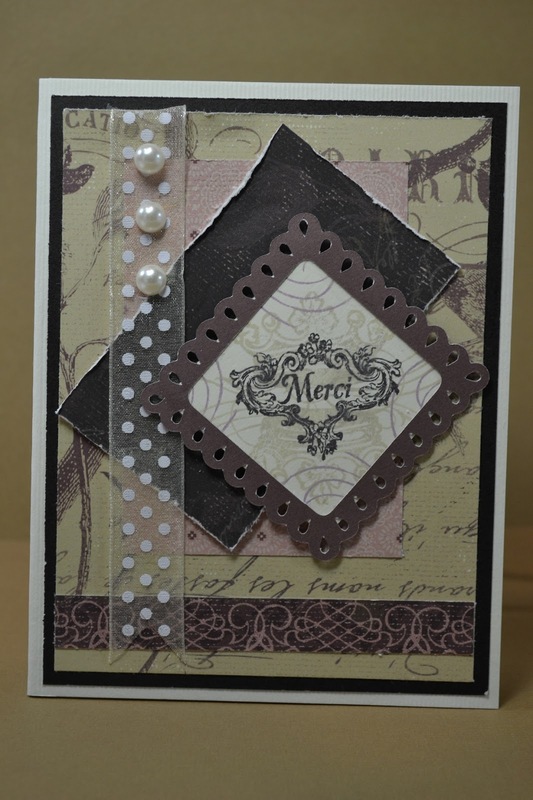 The challenge there this week was to use old buttons. These have been in my stash for awhile, good to get that them on some pages. It's All Good. Already I'm missing Friday, LOL! We have a saying around work, "it's almost Friday" . That gives us something to look forward to and then when it is Friday, we have something to cheer about. It's always a fun saying and it does help when times are tense. This weekend I had a chance to chat with my Mom and I realized, I really miss her. 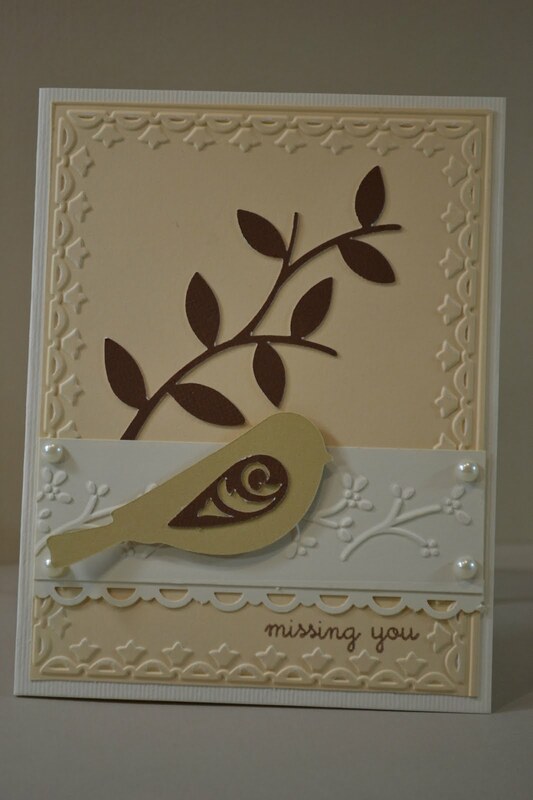 This card is for her. I am still playing constantly with my new Cricut (thank you DH for Christmas present) and I love this bird diecut from CTMH Cricut Art Philosophy! It always comes out so cute no matter what color you cut it in. 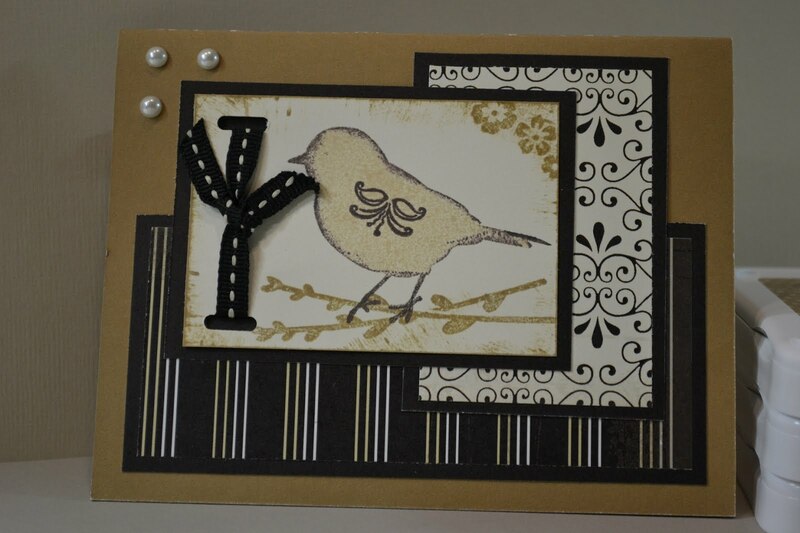 I really started this card for CAS Challenge over at ABC Challenges this week but ... it didn't end up very CAS once I added the leaves. I'm not so good at CAS. 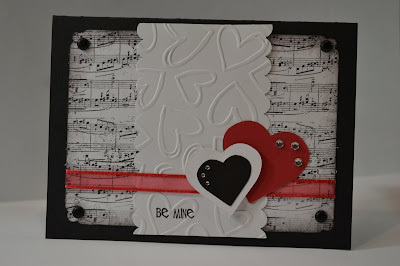 Don't forget to check out the Color My Heart Challenge this week. Big News! Sarah announced the Design Team and I'm going to get a chance to be inspired with the Gals at CMH. Be sure to stop by and play with all the fun color inspirations. Today was such a good day to just stay in and enjoy a restful afternoon. It was just me and my little dog Bella and we hung out in the Stamp/Scrap/Office making Valentines. I have lots to send. One of my 2013 ideas (that was shared with me and I love it) is for "Count Your Blessings" Sundays! I love that idea because I do feel truly blessed. Today, I'm thankful for our very warm and comfortable home. We haven't lived here long but the little ranch we have really works for us, especially now that the boys are off at college. It's comfortable, and I truly LOVE my Lavendar Stamp/Scrap/Office. It's the perfect spot for Inspiration and Creativity. This image is one of my ALL TIME favorite CTMH Stamps! I love these little Snow Friends! I hope for you to see more of them this week. This is MOJO Monday Sketch #273. 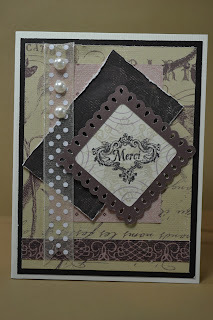 The paper is CTMH Evensong, more faves and I only have a few scraps left. It's much easier and faster to clean up the house when the kids are back at college, LOL! Today my DH was out working on his snowblower and tinkering in his garage and with all the house stuff done ... well, what's one crafty chick left to do ... yup - Stamp and Scrap! Lovin' every minute of it. This is my DS from a couple years ago. I took these pictures from the Living Room Window so they're not the clearest BUT ... you get the idea. Out goofin' around in the snow, texting his friends. Teenagers! 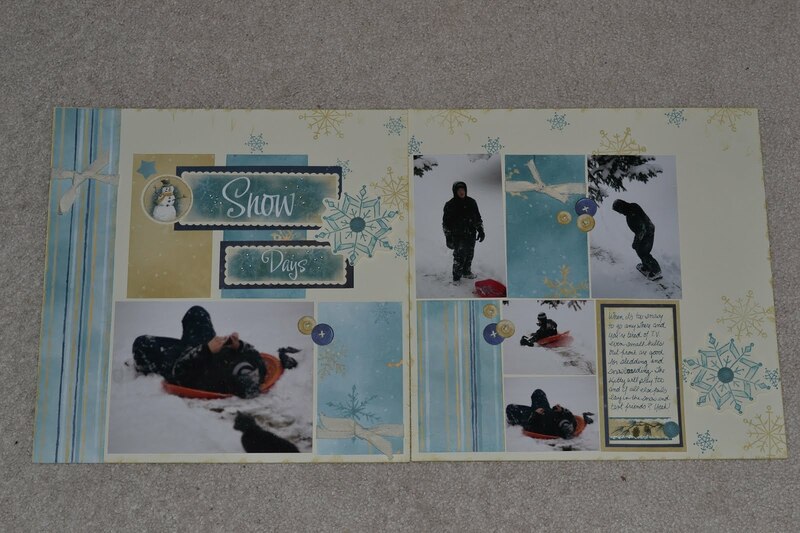 I finished up this layout for the Colorful Creations For the Boys January Challenge. For Christmas, one of the gals I work with got me a little bird feeder that actually sticks on a window with suction cups. My DH was very skeptical it would stay however, being the good sport he is, he climbed up on a ladder and stuck it to my office window, added the bird feed and cleaned the window while he was there, LOL! I've waited for a few days hoping some birds would find it and finally yesterday, I saw that the little black, white and tan finches are landing on it for some seed. They're very cute and I think the window scares them as they don't stay long but it's nice to have it on the window and I hope more come along. 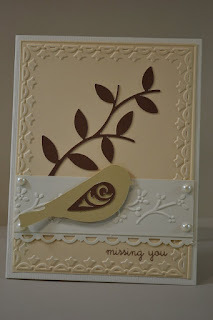 The finches inspired my "neutral" card for the challenge over at Color My Heart this week which was to use all Neutrals. That was definitely a challenge for me as I'm a color kind of gal but ... 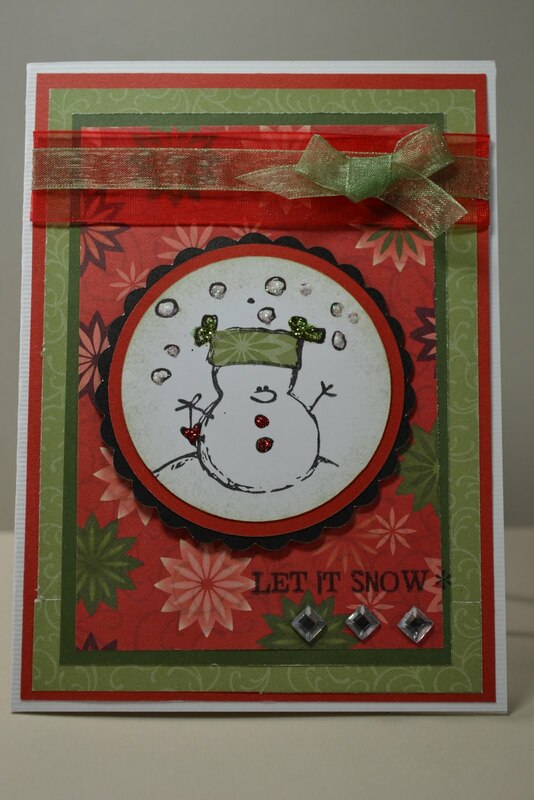 I had help from the CTMH Silhouettes Pack I still have scraps of ... All Good! My family was all home for the holidays and we had a great time together. I think the hardest part for me is that everyone goes back to college and I miss them. The boys just bring that noisy, fun chaos of being a family. My DH and I enjoy our quiet time together but it's always fun at the holidays to have everybody home. It brings a special kind of energy. We have all boys too so it brings a constant open-n-shut of the refrigerators ... but that's a whole other story, LOL! They'll be home soon for Spring Break ... I hope. Well, if you know me, it's not hard to guess that I'm an Aquarius. I definitely like to be in control, LOL! The other fun thing is that it's my Month to be Birthday Girl for the Friends that Scrap Group and I got picked to be "Queen of the Month" for this month so it's going to be a "Happy Mail" Good Time! Tonight I was working on Valentines. I'm looking forward to having a Valentine Countdown so I can't show you the card I finished tonight so I finished up another one w/ the supplies left on my desk from last night. I think I'll send it as a thank you for the Queen Gifts. Woohoo! A new year starting out with some fun stamping and scrapping! I love it! Bless my DH Heart, he could tell I was bumming about having to go back to work tomorrow so he was quite supportive of scrap/stamp space today. 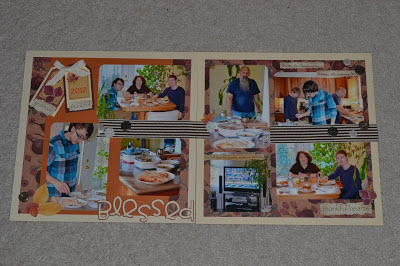 It started out a good year - 10 Scrap Pages and 6 cards. It's all good.